I think books specifically designed as "easy readers" are great. They support young readers by restricting vocabulary and sentence structure, while cementing a love for reading with exciting plots and interesting characters. Publishers ensure there is lots of white space in these books so that youngsters won't be put off by dense text. But what about kids who have struggled with reading, and are reading below their age level? If you're fifteen, you don't want to read stories targeted toward the interests of ten-year-olds. That's where books like those from High Interest Publishing come in. The company has a range of genres, all designed to be high in interest and low in difficult vocabulary. They also support parents and teachers with guides to using the novels in classroom situations. The Last Dragon (2009) is the first of the Dragon Speaker trilogy from HIP. It was written by Canadian author, C. A. Rainfield. As soon as I began reading it, I was caught up in the story. I didn't notice simple sentence structure and lack of complex vocabulary because I was intent on racing through the pages to discover what happened next. In the year 1144, dark times have fallen over the kingdom. Lord Manning rules through fear and magic, and the land’s only hope seems to lie in the Prophecy. 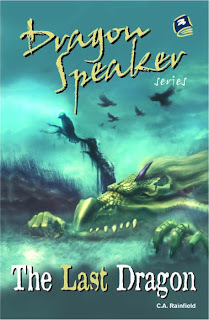 The Prophecy says that a dragon speaker will appear to save the kingdom. Yet there are no dragons, and no one who knows how to speak to them … except, perhaps, Jacob of Malden. Jacob is an unlikely hero – a small young man who walks with a limp and has the power to speak with birds. But when the last dragon returns, it is only Jacob who can speak with her. It is only Jacob who can call upon her help. And ultimately it is Jacob – with his friends Orson and Lia – who rescues the egg of the world’s last male dragon. I like Jacob. I love the fact that he can talk to birds and dragons, and that he tries to do what he believes is right. He still has nightmares about the night he lost his mother and brother to a fire, the same fire that caused his scarred and withered leg. Life is definitely not easy for him. His enemies are powerful. Yet like all heroes, he perseveres. The Last Dragon has all the elements that make a good fantasy - lots of action, some scary bits, problems to solve, a believable hero we can relate to, evil villains, magic, and my personal favourite, dragons. It would make a fine read for mature youngsters who don't find reading difficult. But it's perfect for the audience it targets - young teens who enjoy fantasy, but who are not yet strong readers.